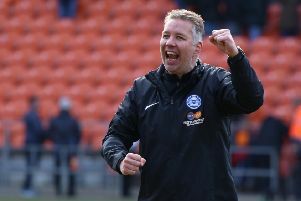 Former manager Darren Ferguson wasn’t reluctant to commend an impressive Peterborough United performance today (October 24). Ferguson, the most successful manager in Posh history with three promotions and a Johnstone’s Paint Trophy Final win on his CV, returned to the ABAX Stadium for the first time since his sacking last February, but watched his Doncaster Rovers side succumb to a 4-0 reverse at the hands of some incredible, free-flowing attacking football from Graham Westley’s men. But Ferguson was honourable in defeat. He also thanked the Posh fans for their generous reception before the game. Ferguson said: “Although it wasn’t the result I wanted, you have to give credit to Peterborough. They were good. In every department they were better than us. “The game just didn’t pan out the way we wanted it to. We didn’t want the game to be stretched. That sort of game suited them and they took advantage. “In any game, the first goal is crucial. If we had scored first we would have been able to pick them off on the counter attack, but instead they scored it and they went on the play very well. “We’ve conceded five goals from set pieces this season and two in the last two games which isn’t good enough. “We changed things round at half-time, but within two minutes they scored a lucky third goal after a couple of deflections off our defenders. “Sometimes you have to take your medicine and admit you were beaten by a better side. That was the case here. We lost mainly because we just didn’t keep the ball well enough. “It’s only my second game at the end of my first week. We knew we had work to do and this performance confirmed that. “The only good thing from the day was the reception I received from the Peterborough fans. I was really pleased with that. The defeat sent Doncaster back into the relegation zone ahead of a tough Tuesday (October 27) assigment against in-form Millwall.